In this study, we used comparative genomics and developmental genetics to identify epigenetic regulators driving oncogenesis in a zebrafish retinoblastoma 1 (rb1) somatic-targeting model of RB1 mutant embryonal brain tumors. Zebrafish rb1 brain tumors caused by TALEN or CRISPR targeting are histologically similar to human central nervous system primitive neuroectodermal tumors (CNS-PNETs). Like the human oligoneural OLIG2+/SOX10+ CNS-PNET subtype, zebrafish rb1 tumors show elevated expression of neural progenitor transcription factors olig2, sox10, sox8b and the receptor tyrosine kinase erbb3a oncogene. Comparison of rb1 tumor and rb1/rb1 germline mutant larval transcriptomes shows that the altered oligoneural precursor signature is specific to tumor tissue. More than 170 chromatin regulators were differentially expressed in rb1 tumors, including overexpression of chromatin remodeler components histone deacetylase 1 (hdac1) and retinoblastoma binding protein 4(rbbp4). Germline mutant analysis confirms that zebrafish rb1, rbbp4 and hdac1 are required during brain development. rb1 is necessary for neural precursor cell cycle exit and terminal differentiation, rbbp4 is required for survival of postmitotic precursors, and hdac1 maintains proliferation of the neural stem cell/progenitor pool. 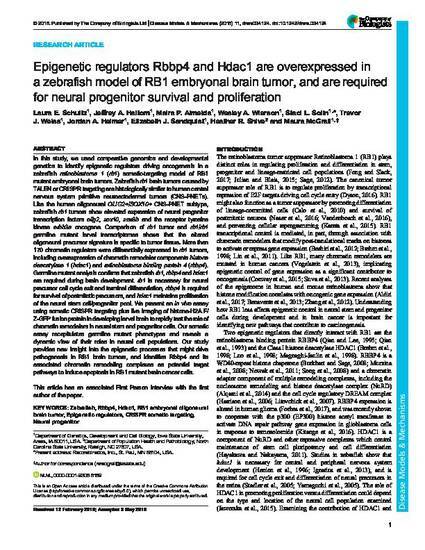 We present an in vivo assay using somatic CRISPR targeting plus live imaging of histone-H2A.F/Z-GFP fusion protein in developing larval brain to rapidly test the role of chromatin remodelers in neural stem and progenitor cells. Our somatic assay recapitulates germline mutant phenotypes and reveals a dynamic view of their roles in neural cell populations. Our study provides new insight into the epigenetic processes that might drive pathogenesis in RB1 brain tumors, and identifies Rbbp4 and its associated chromatin remodeling complexes as potential target pathways to induce apoptosis in RB1 mutant brain cancer cells. This article is published as Schultz, Laura E., Jeffrey A. Haltom, Maira P. Almeida, Wesley A. Wierson, Staci L. Solin, Trevor J. Weiss, Jordan A. Helmer, Elizabeth J. Sandquist, Heather R. Shive, and Maura McGrail. "Epigenetic regulators Rbbp4 and Hdac1 are overexpressed in a zebrafish model of RB1 embryonal brain tumor, and are required for neural progenitor survival and proliferation." Disease models & mechanisms 11, no. 6 (2018): dmm034124. doi: 10.1242/dmm.034124.